As friday day was coming to its end I decided to have a walk down to see how the Rhondda was looking after the recent rain to see if there was any possibility of fishing it the following morning with my mate Dan. It was still running high but running as clear as a bell. It was all set then to fish in the morning, well we thought it was. The following morning I woke to the sound of rain on my flat roof. After dragging myself out of bed to have a look to see how the Taff was running to gauge how much rain we had in the night, it was clear that we had a fair bit but I was hoping that the Rhondda wasn’t effected too much. It’s surprising with the Rhondda, it rises quick and falls just as quick. Not bad having two cracking rivers on your door step. As I was thinking and hoping that it was fishable, my mate Dan rang to say he was on his way and to meet him by the train station. After a short wait, Dan arrived and we made the dreaded walk to have a look at the Rhondda. I could hear the river and I knew straight away we had no chance, I looked over the wall and it was running way deep and fast with a slight colour. That was the end of that so we had a quick chat and then decided to check the clydach out . We put are marching boots on and away we went. We finally got to the stream around 9ish and all looked good. It was Dan’s first time on the clydach and I just couldn’t wait to show him around. I know Dan loves fishing the stream and I knew that he was in for a treat. 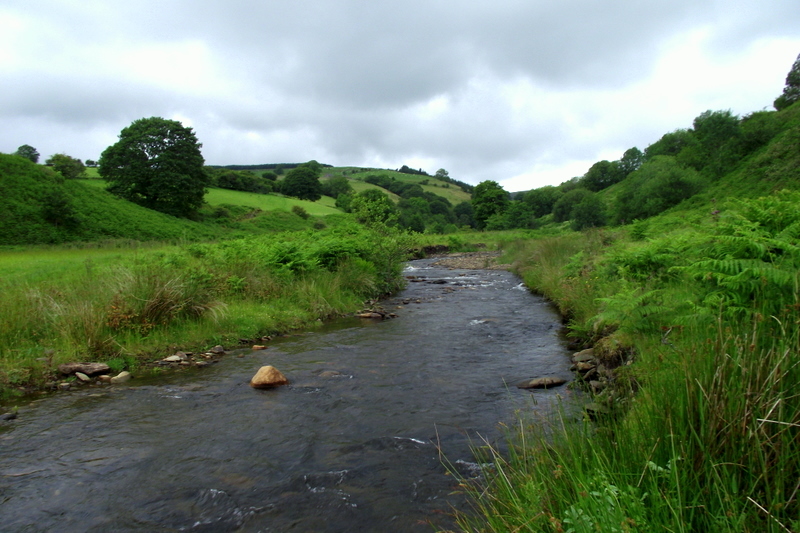 The stream was running with a fair flow and coloured but I knew that it would clear off later in the day. Dan set up on the dry straight away and I could see that he was itching for the first cast so I left him to it. Myself, I set up on the klink and dink because of the water colour knowing that I had a better chance with the nymphs but also knowing there was a chance on the dry. 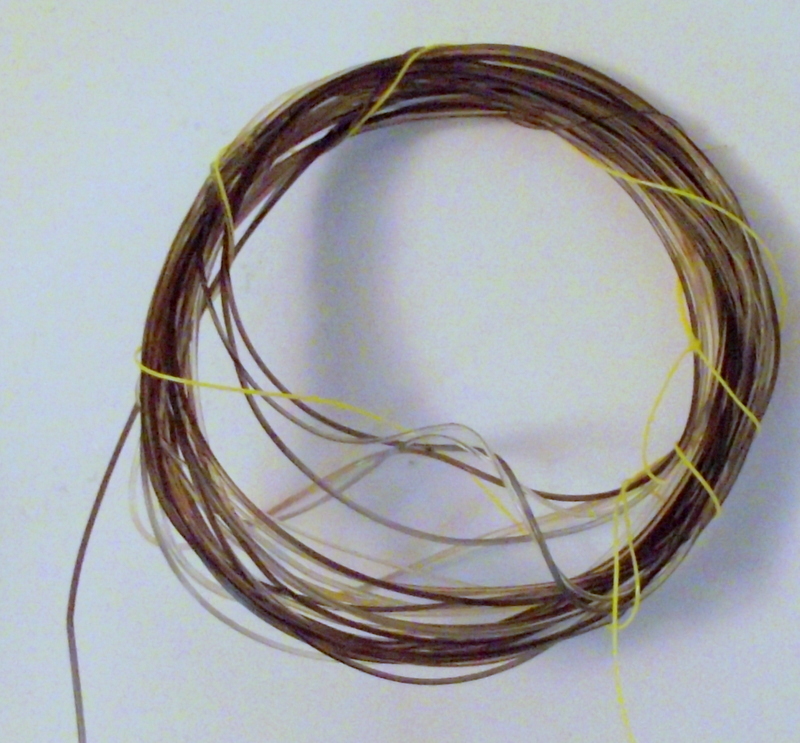 I put on a Size 14 hare’s ear klinkhammer, and on the dink a 2m gold hare’s ear jig. 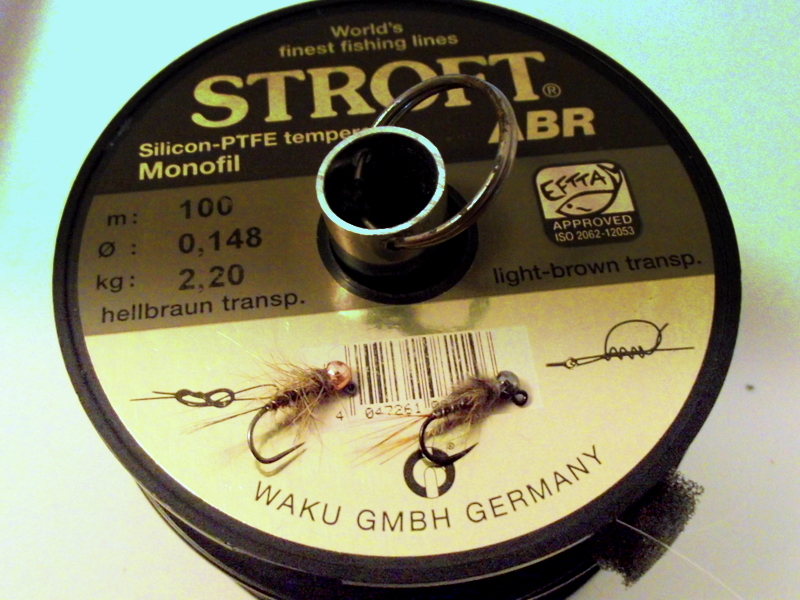 When I’m using this method in the stream when it’s coloured I tend not to cast the fly line out, I just use a long leader and get in as close as I can and hold everything of the water to minimize drag on both the nymphs and dry and it works very well for me. Dan below tying his very large dry on at the start of the day. These are the kind of runs that are all over the Clydach and what more can I say but beautiful, I’m a lucky man. Every corner looks better than the last and every pool and run holds a golden gem. 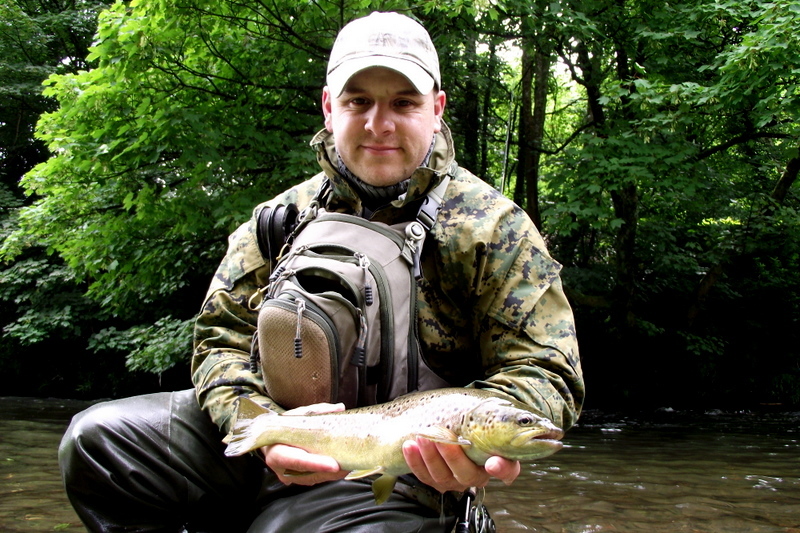 As the day went on with many fine trout to hand, Dan my good mate was a little camera-shy for some reason and took over taking the shots and a few short videos of me using the klink and dink. Just want to say, Dan thanks for taking the photos and the great videos mate. I hope the flies come in handy;) As I was saying Dan shot a few cracking videos of me catching a few trout in a lovely looking pool. Here they are. After catching that fine stream trout me and Dan just sat back and had a bite to eat and just talked about the fishing as you do and a few other things. After Dan talked my ear off 😉 I thought it was time to move on, Dan I just had to get that in mate :). At this point the river was clearing up a little and a few brook duns started to come off along with a few olives & stone flies. With this hatch on we were just waiting on the fish to start rising but it just didn’t happen. They were just hooked on the nymph and didn’t bother with the dry for some reason. 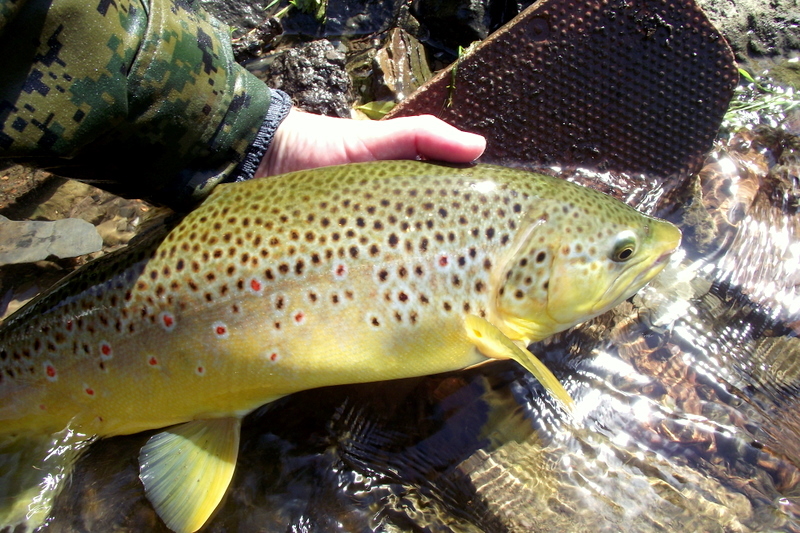 I found out Dan was a bit of a purist at this point on the streams and didn’t really want to change from the single dry fly and it was hard trying to convince him to put a nymph under his dry; the stubborn bugger. Dan being Dan just had to go on with the dry for a little longer and prove me wrong by catching a fair few in one long run, I take my hat off to his perseverance and determination to catch on the dry, here is the stubborn bugger below getting into a good position. As the day went on me and Dan got stuck right into it fishing hard with many trout to hand and a few good fish lost at the net. I’ve got to say Dan lost a right lump in one run and was very unlucky not to land it . I’m sure it would have been the fish of the day by miles, big head shake and a flash and gone. It’s never a nice thing losing a good fish but chin up and move on and find the next. 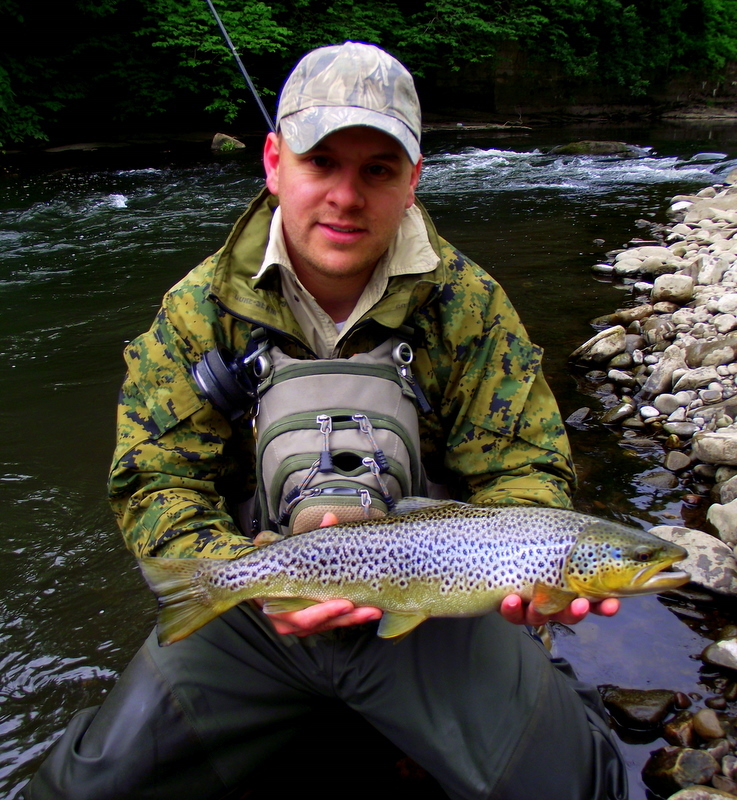 After a long days fishing with dan with a good number of lovely wild trout to hand its was that time to make a move home again. Not an easy decision to make with the fishing being so good and having great company to share it with. Thanks Dan. Just two more video from the great day’s fishing on the klink and dink along with a few more photos. 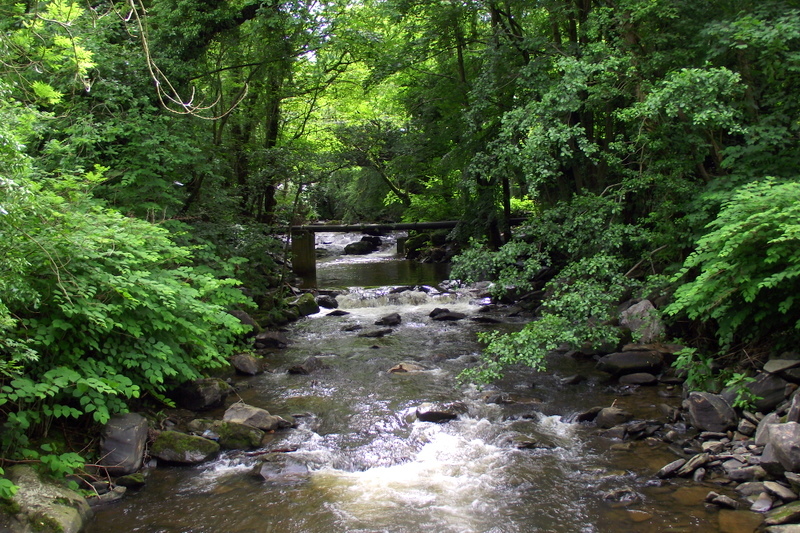 This entry was posted in River Clydach and tagged brook duns, klink and dink, south wales, stream fishing on June 26, 2011 by fishstalker666. I found myself going back home today to fish the stream that i havent fished in a good while and where i was first shown the noble art of the drowning a worm by my older brother. Much has changed since then and its all fly for me these days. The weather was not up to much being over cast most of the day with little odd glimpses of the sun breaking through the cloud cover, but what made things a little tricky was the down stream wind that i had to put up with throughout the day. 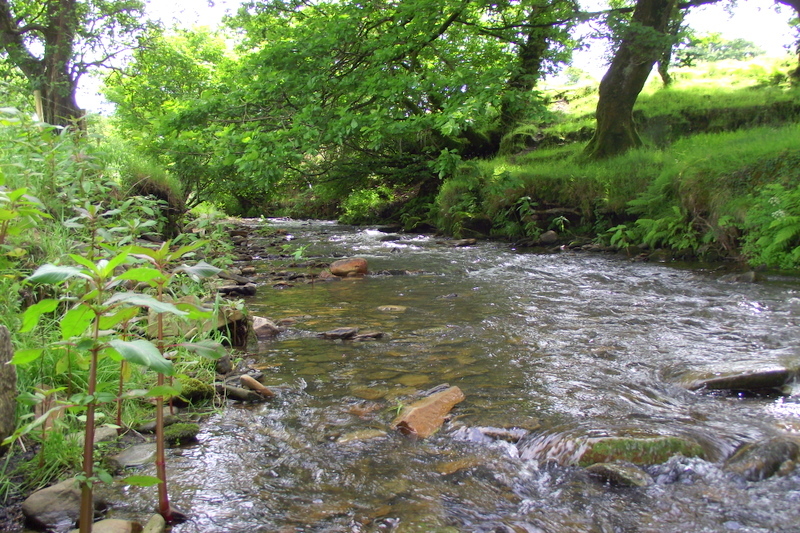 It’s not the largest of streams, it’s around 6 to 8ft wide at the most but as wild as you can get it. 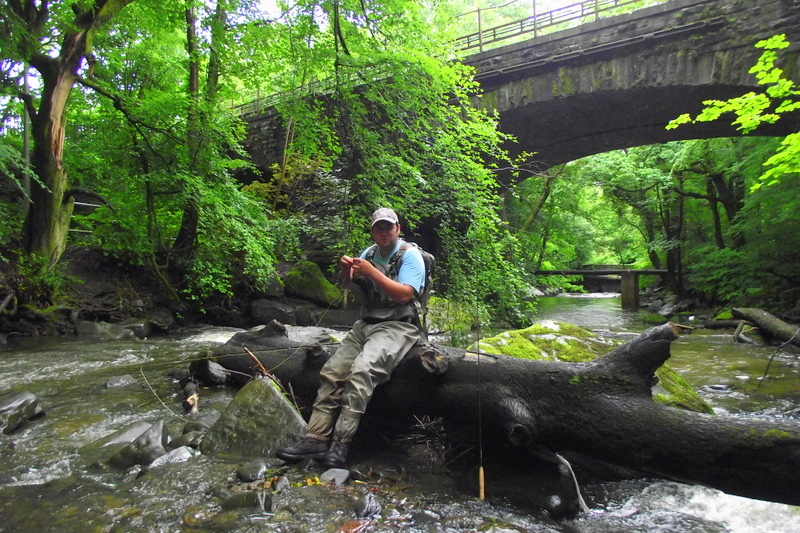 Most of the stream is covered over by bushes and trees but there are a few places that open out in to open fields so the casting becomes much more easy and instead of being on your knees you can straighten the back and cast from the bank in confute. Before i even set my greys 8ft up on the dry i sat back and just watched the water for a bit just taking in my surroundings and watching the water for any movement. 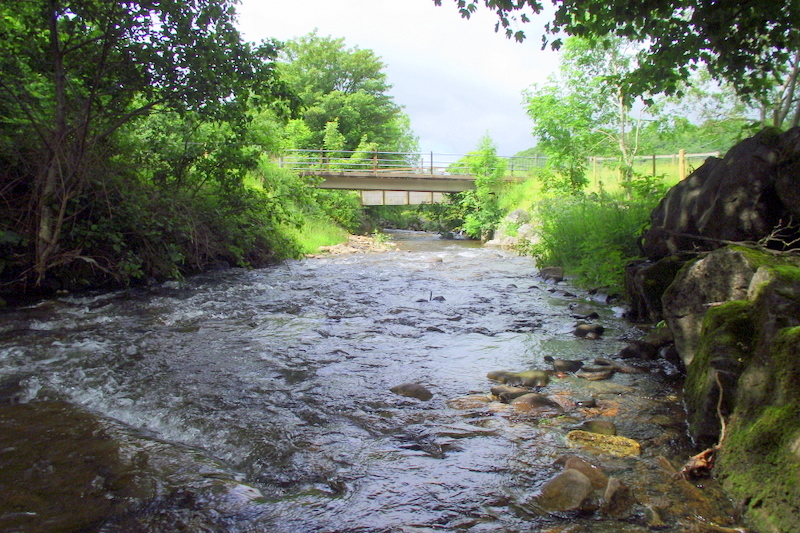 I started watching one part of the stream where there were a few rocks that had slipped in the water from the bank forming a small eddy just off the fast water in a small run. Just after a few minutes i seen a small splashy rise so that was my q to get moving so on with a size 16 hairs ear klink with a white post so i could pick it up on the dark water surface because of the cloud cover and away i went stalking the rise. I got on my knee and made a short cast above where the fish moved and as soon as the fly hit the water a fish took the fly. Grease lightning had nothing on this little fella. The take was just savage and after a few jumps he was in hand and a quick photo and away to sulk. This was the first fish of the day but many followed after. 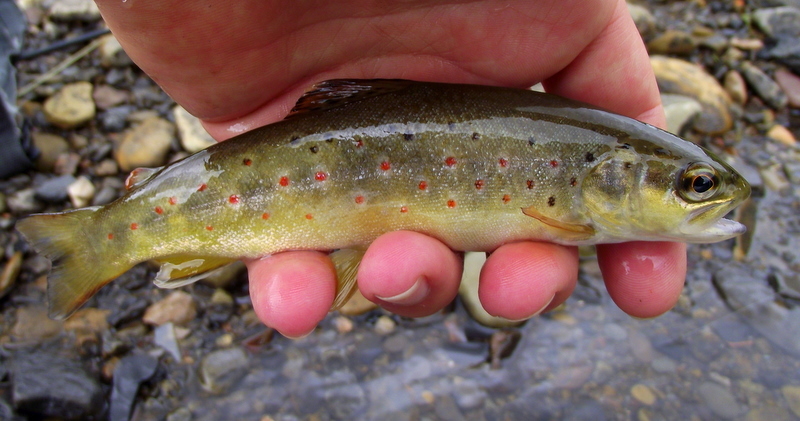 I just love the colours on these little wild trout, just beautiful. 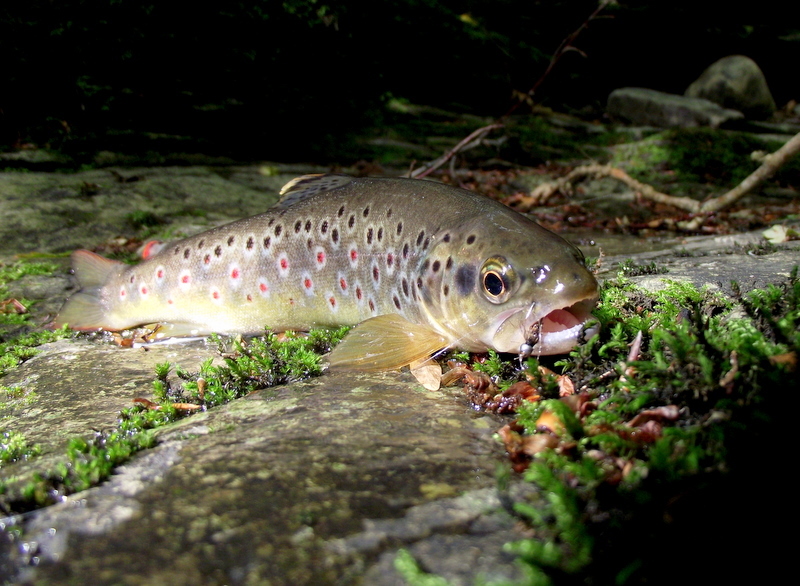 After the short video i managed to catch anther lovely wild brown trout on the nymphs in the same run but after a few more cast i knew that the pool was spooked, so i moved on out looking for the next likely spot to hold anther jem of the stream. As i made my way up river i come to this spot above in the photo and thought there just has to be something hiding in there 🙂 After a few cast with a few really fast takes from the very small fish, i managed to land anther little Jem. 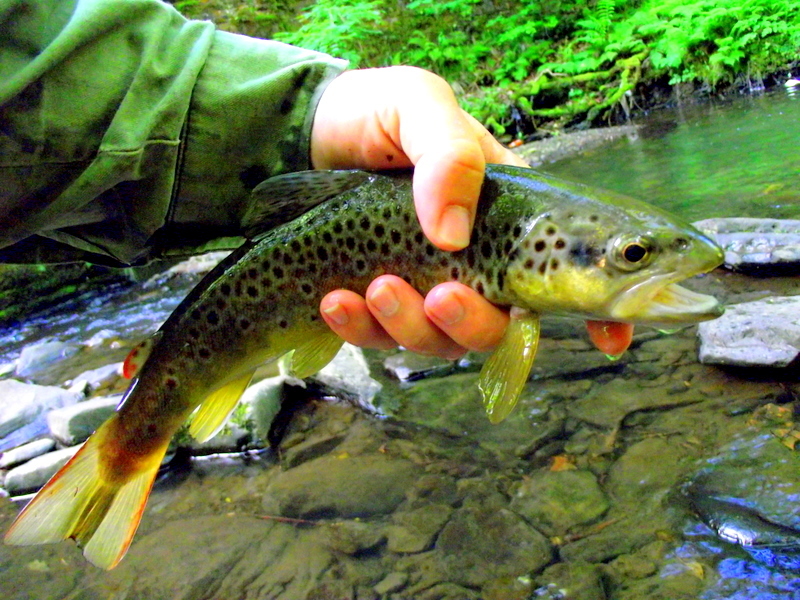 The trout in the stream are not big but that means nothing to me. They hold everything in their beauty. The red spots and little marking and the white tips are just perfect. Its funny when i was young all i wanted to do is catch big fish but the older im getting the more i like to catch the smaller ones 🙂 Funny how things turn around in time. At this point in the day i was very happy on how it all went and decided to make a move home and see the family before they had to send a search party out. 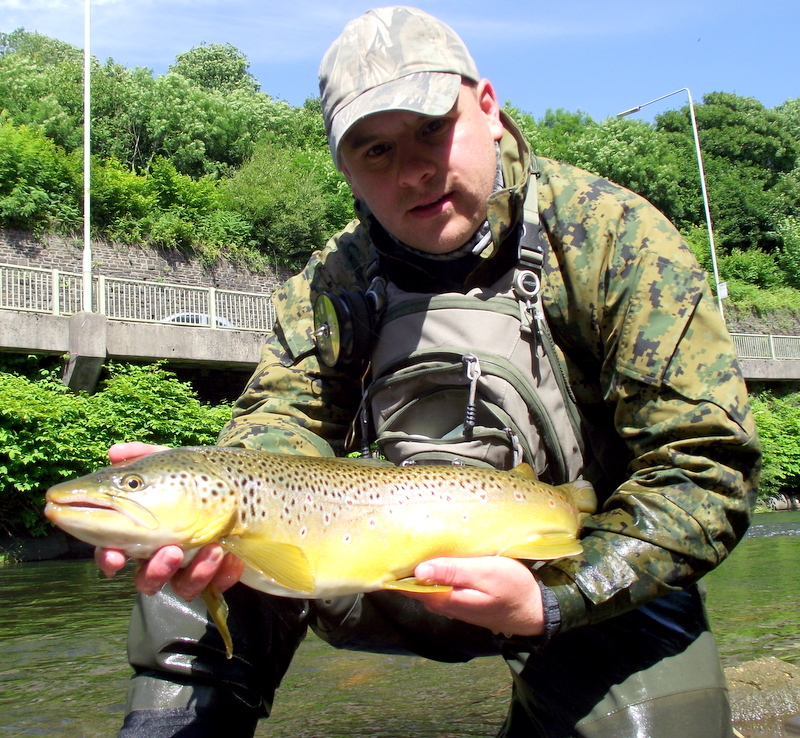 This entry was posted in Uncategorized and tagged dries, flyfishing, south wales, stream, trout on June 22, 2011 by fishstalker666. Im so glad that the weather made improvement from raining hard most of the weekend and giving me the chance to wet a fly before I had to back to work on Monday. Starting off with the french leader i picked my way up river very gingerly fishing all the slack water i could find and placing my feet as careful as i could, i didn’t want a wetting and didn’t fancy taking a swim either. I come to a very fast deep run and made my way across the river so i could fish the slack part behind a few submerged boulders where if i was a trout ide be hiding. I set my video cam on and thought ide show you a few videos using the french leader with good success. Well the way it was going i thought it just couldnt get better. 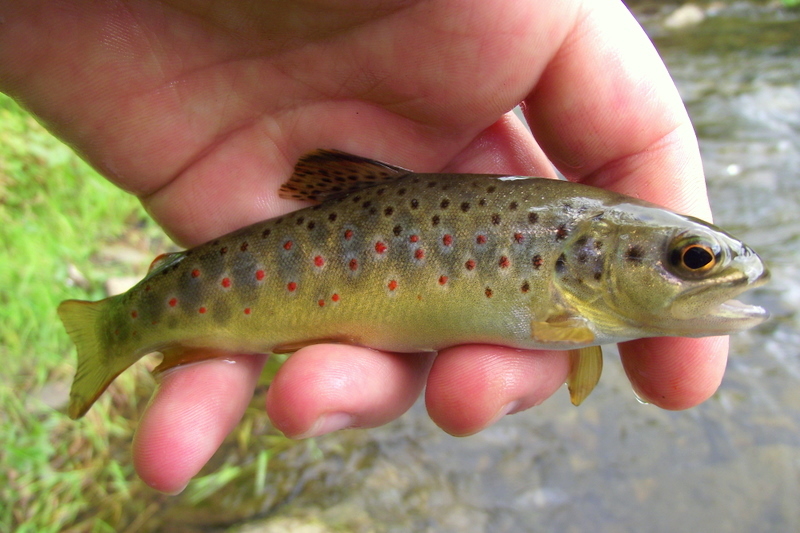 (WELL THATS WHAT I THOUGHT) Trout started to rise in good numbers all down to the better hatch of olives on the water and i was steadily making good numbers. This is why i like to use two rods because you can change over with no bother at all. As i was making my way just watching the bank for the really slow and small rises, hoping for a better size trout to be feeding i seen a small little splash under a tree branch just touching the water, well not a splash it was more like a little jet of water, nothing really i just thought minnows, but something just told me to check it out. I made my way to a spot over looking the water and to my SURPRISE!!! 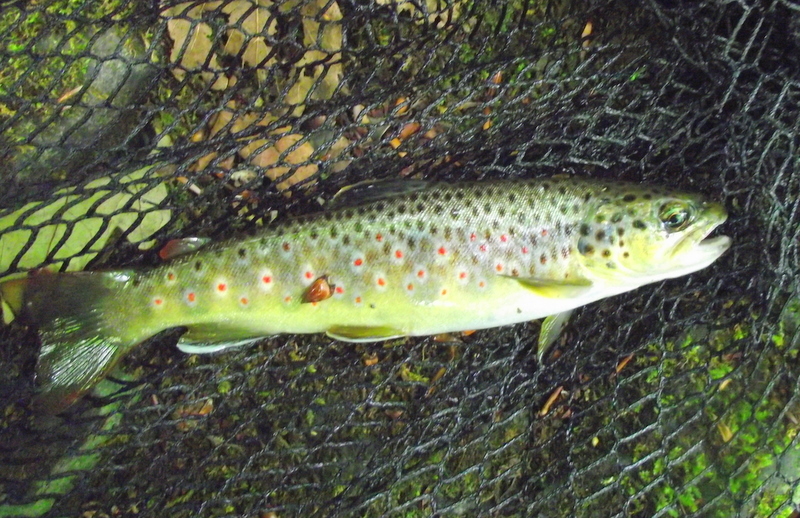 i seen this large trout just mopping up the olives just under an over hanging bush. I got the camera out and shot this video 🙂 I was just fascinated watching him taking the flies. I think im really lucky to see this and catch this on camera on are river. 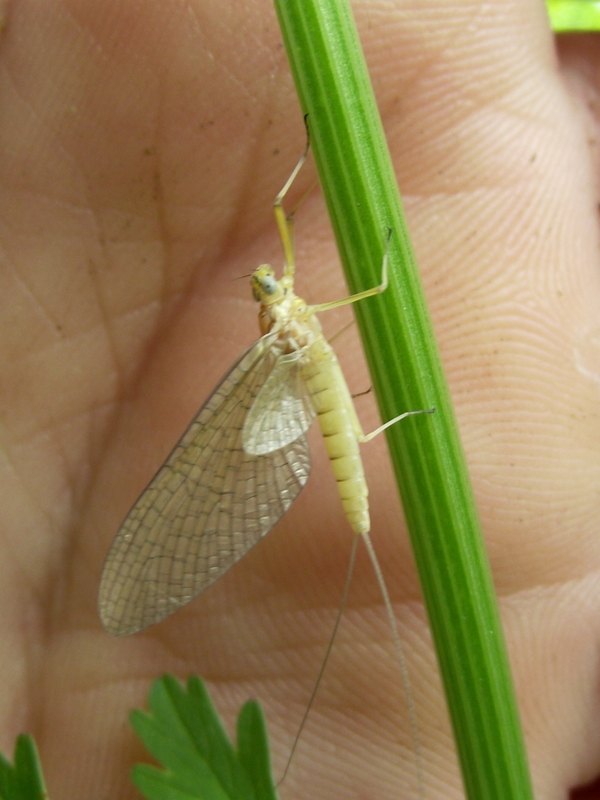 This entry was posted in River Rhondda and tagged dries, fly, fly fishing, french leader, leaders, nymphs, rising trout, waders, water on June 19, 2011 by fishstalker666. Not long after we got to where we wanted to be on the lower beats of the Ebbw, we parked on top of an old bridge and as every angler does when you come to a bridge with water running under it, we had to have a good look to see if there was anything moving or if we could see any fish lying up. There was the odd rise and we did see a few fish static on the bottom, this just made us more eager to start. 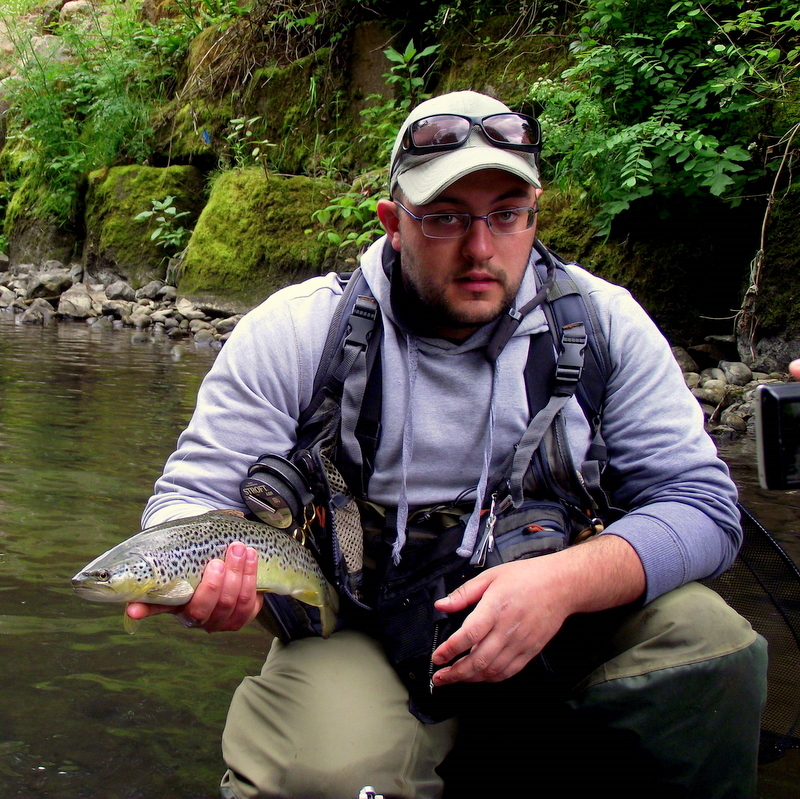 We decided to go fish for fish from the start because of the low water condition and for how narrow the river is. It’s a great way of fishing if there are a few of you on the water and as always if someone does something wrong or dropped a fish, be ready for a good ribbing:). Moving onto first run of the day it fell to Bish to kick off. After a few well placed shots in the trees and bushes we new that it was going to be one of them days. We didn’t laugh I promise. We took everything in our stride and just worked the pools and every little eddy we come across with surprising results and a few lost nymphs. I’ve never really been into fish for fish but i’m starting to really enjoy it because im starting to fish the hard water that i would have passed on before. 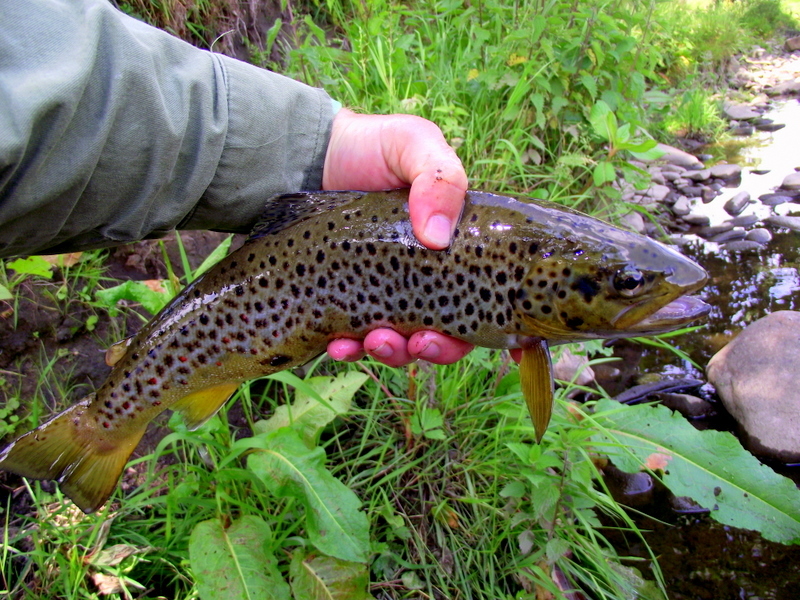 I will say that i’m not the best angler in the slow dead water where there are no rising fish, but I am working on it. I think it’s just a confidence problem. I do sometimes find it hard to drag myself from the fast water. I’ve been taking lots of good notes and information from Kieron and Bish on light nymphing with the french leader, I’m a bit of a heavy merchant and find it hard to take the 3 miller off on times. Moving on up river even further we started to see olive on the water, B.W.O and not long after the fish started to rise in better numbers. We come to a very slow pool with a few fish rising in the middle, so kieron set himself up and crept forward trying not to spook the pool by just taking a few sets at a time and waiting for a few seconds before moving again. He eventually got to where he could cover a lovely rise. 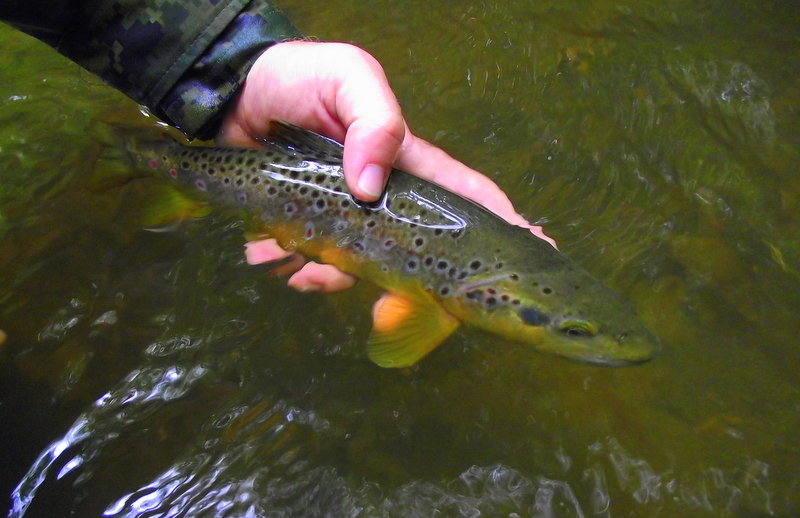 A few seconds later and a cracking long cast up river, the trout took the fly and down river she come, didn’t seem that big really untill it was under his feet and started to dart off with quick spurts and heavy head shakes. I pulled the camera out and shot the fight. After the fish above we decided to make a move on back down river because it was getting late on in the day and we covered a lot of water, we had a fair walk back to the car so didn’t want to get home to late or i would be in the dog house again 🙂 On the way down we found a few fish rising not far from the car so kieron set the dry up and we finished off with too more videos. 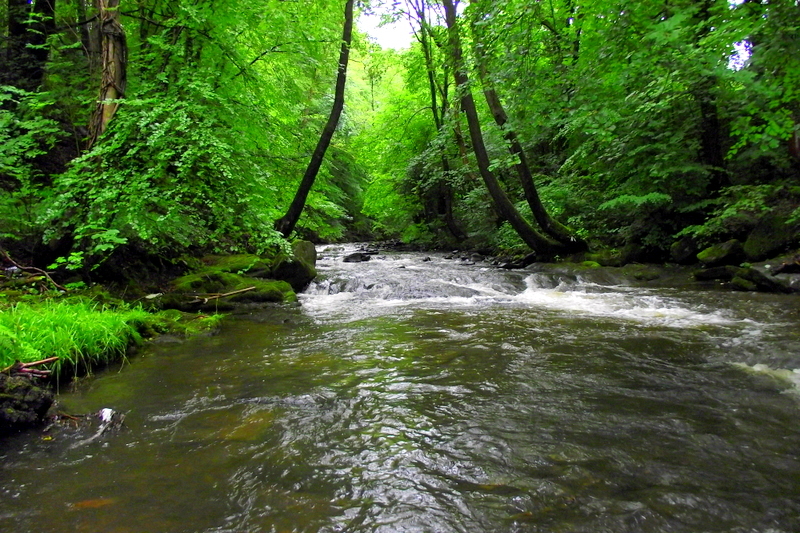 This entry was posted in River Ebbw on June 12, 2011 by fishstalker666. 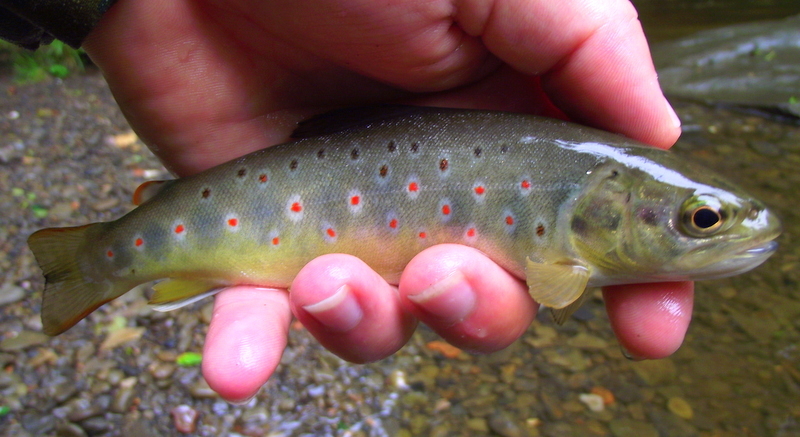 Had the chance to book a day off yesterday so i jumped at the chance and made plans to fish the Clydach stream, Its been a long overdue trip. I started out around 8, and set my self ready for the 2 mile hike and off i set. 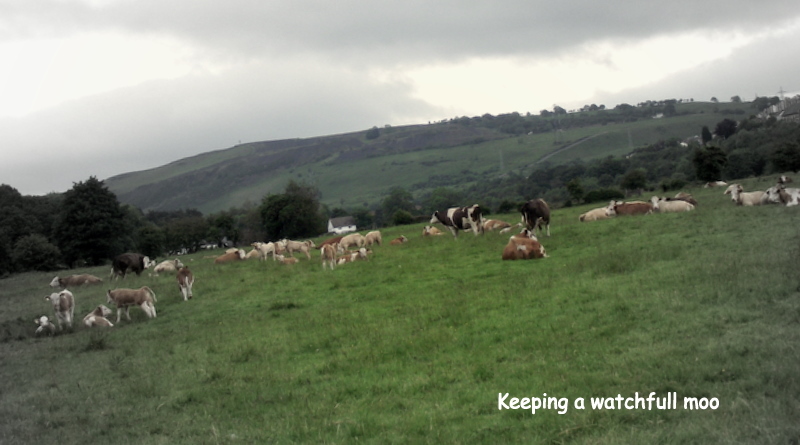 As i got to the stream, i noticed that it was at a low level due to the lack of rain. We really need a good shower to give the system a good flush through. 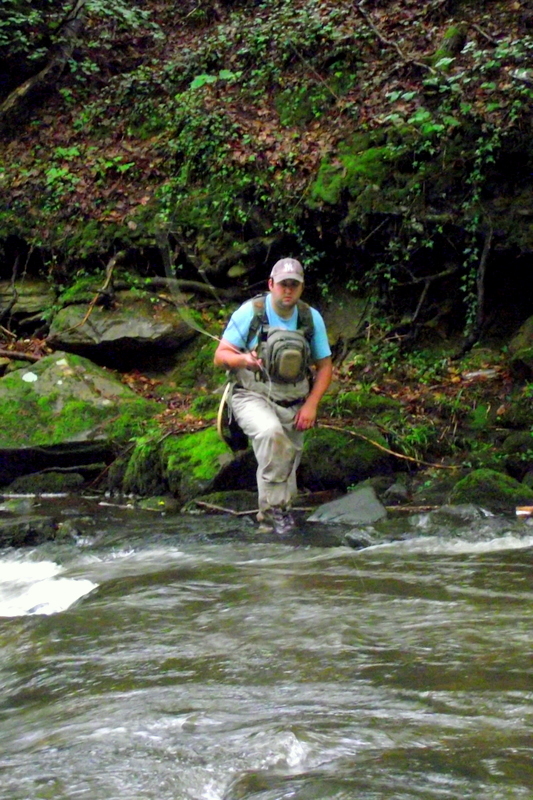 Due to the low levels, i made my way to the deeper runs and pools, although i did try my luck on fishing the small pockets of water with good success. Finally, once at the deeper runs i changed from using a single fly to using the clink and dink method due to the lack of rises and fly life. I think this was just due to how early in the day it was because as the day went on the rises increased with a good number of olives on the water. 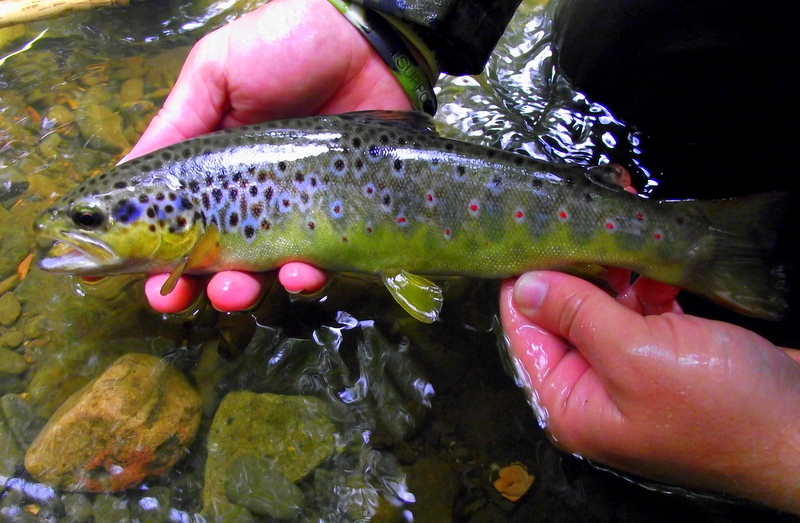 After just a few casts, a lovely browny obliged to my dry. After a quick fight and photo, he was slipped back to get on with his business. After releasing the fish above i headed to front of the pool just casting into rough water working the nymph. 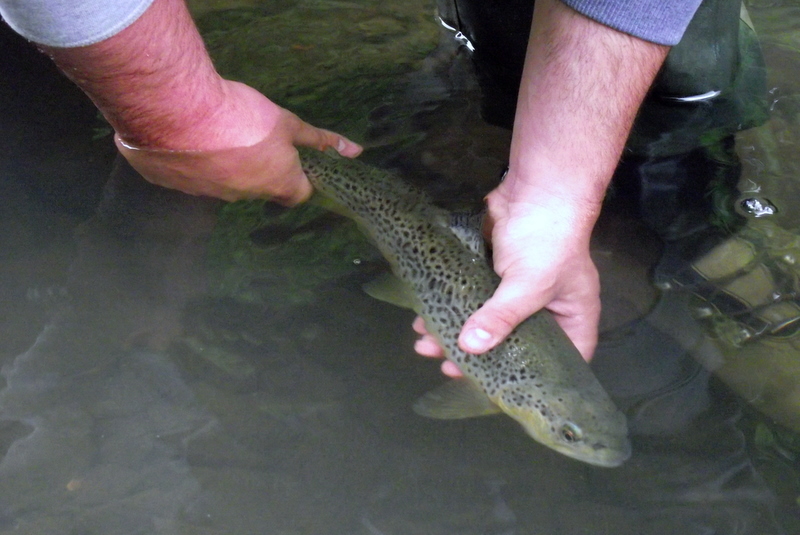 After just a few casts the clink went under and a lovely trout come right out of the water and shortly after a few jumps and dashes he came to hand. Not very big but what a beautiful fish. 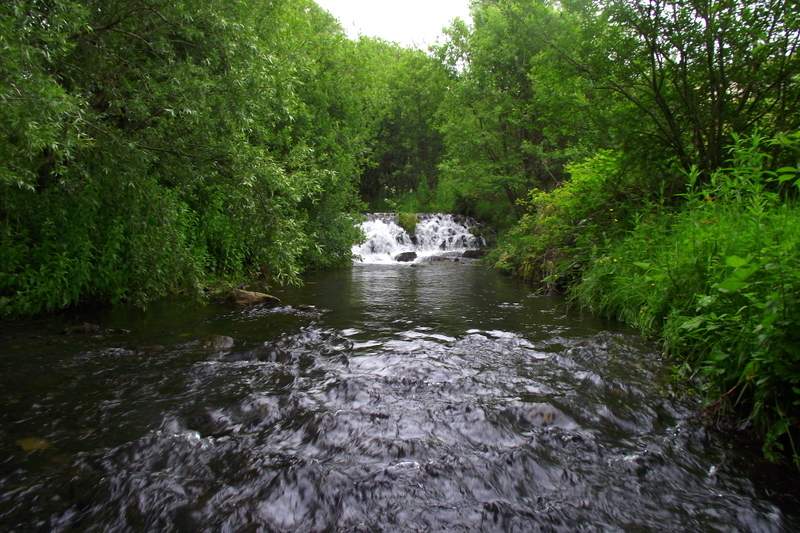 What more can one want in these wild streams. 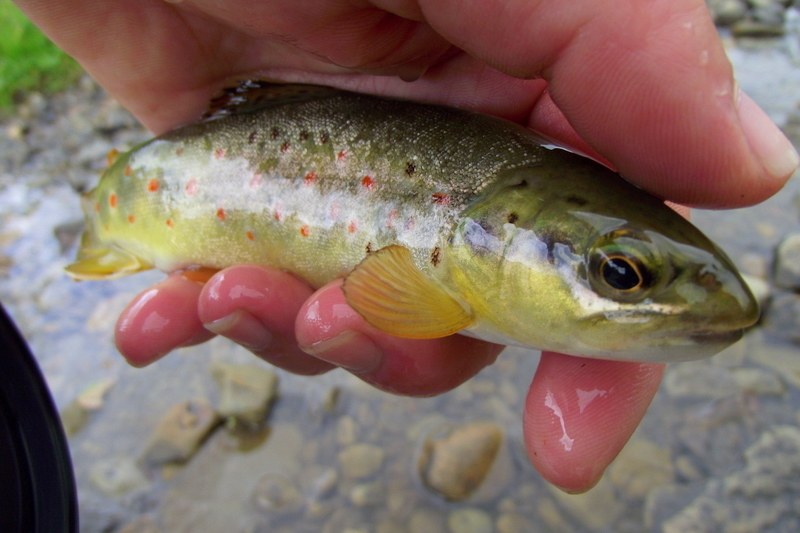 After moving on up stream picking a few more fish up the fly life started with, Brook duns, olives, and stone flies.With these coming off the fish were rising more freely. I could start targeting fish and stop casting blind like most of the morning. Just the way i like it. Moving on up stream i come to a pool that i could see a few fish rising in the back edge so i thought i would give the video a bash. On with a size 14 olive and video set on,and away to go. After a lovely few hours fishing the Clydach with many trout to hand i thought i would make a move down onto the taff to make my way home. As i come down river to cross over i seen a fish rising on the far back and i just couldnt help myself, i just had to have a cast. Same fly, Size 14 olive, Second cast and away she went. What a lovely end to the day. Here is the last fish of the day before the long walk home. 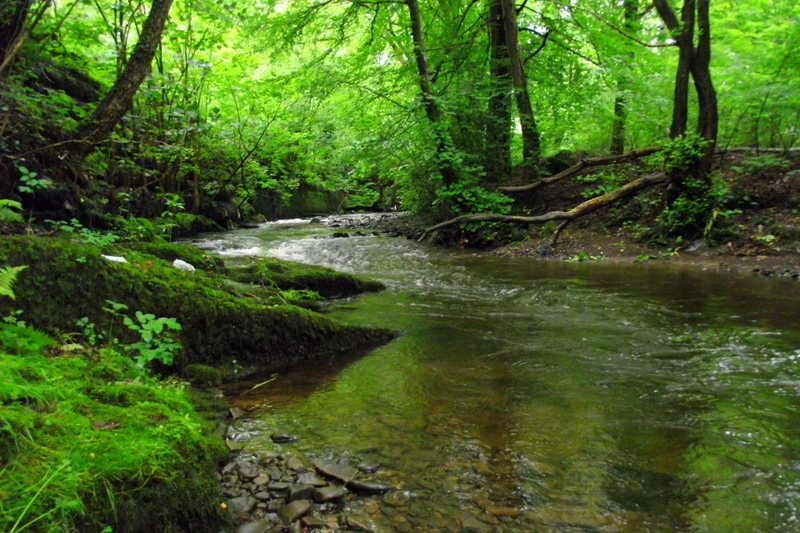 This entry was posted in River Clydach, River Taff on June 9, 2011 by fishstalker666. Today me and my friend Paul Jenkins ‘Bushy’ fished the newly leased ‘Ospreys’ streach of the River Taff at Cilfynydd towards Abercynon. We met at the Car park in Cilfynyd ind’est at 9am. We walked to what was the old boundary of the Ospreys stretch and started to walk the newly acquired waters – looking at the pools and debating what methods to use. 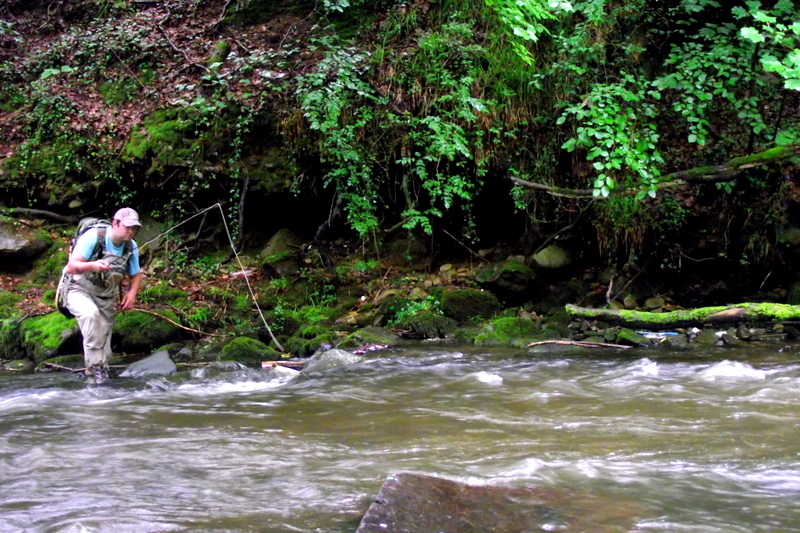 As always, I took two fly rods, My Greys streamflex 10ft 3# and My favourite – Greys GS2 8ft 4#. Carrying two rods can sometimes be a pain, but due to the frequent but sporadic hatches of Olives, Yellow mays and Brook duns having two rods enables me to swap and change without re-tying my leaders or methods and cover that fish that s rising before it goes down. To start, I tackled up with a team of flies on a french leader. My french leader consists of a 9 meter tapered leader and a duo coloured indicator nylon. The business end consisted of 6ft of 4lb Stroft ABR and two jigs spaced around 18 inches apart. 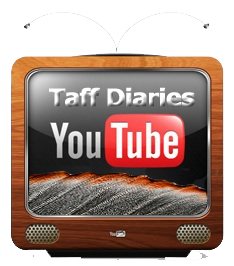 The flies where basically hears ears with 3mm tungsten heads – gold and black. 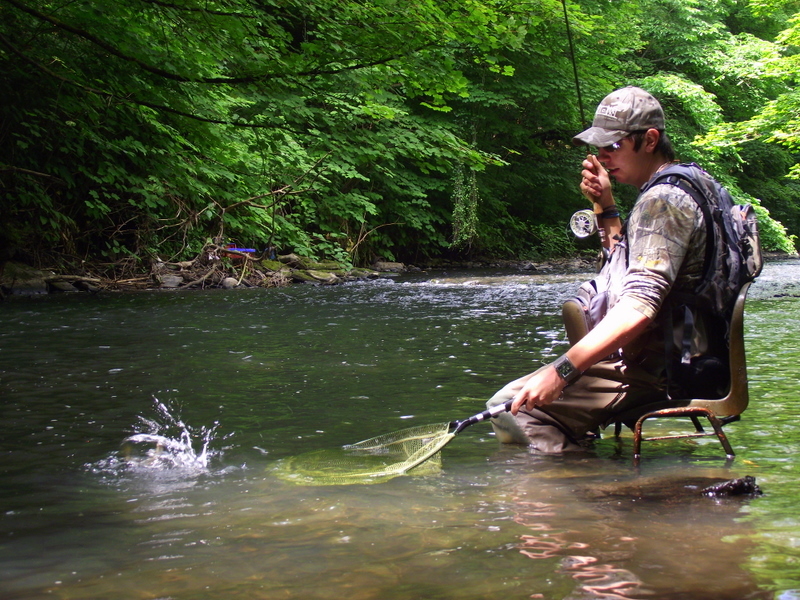 After a quick chat with Bushy, we decided to fish – fish for fish. Meaning one of us would fish and the other watching, I like this method of fishing because it allows me to watch different anglers in different situation. As Bushy is one of the top class anglers in the country, it’s always good to keep a sharp eye on what flies ‘he’s putting on and what he’s doing in different water. We worked our way up the stretch taking around 6-7 fish out of the first 100 yards between us, It was obvious we were doing something right! The river was on good form although being low and clear, the fish were very obliging in taking our nymphs. Once fishing the fast pocket water, we could see a nice long glide in the horizon! So it was on our bike and towards to pool we went. Creeping and peering through the pea shooters it was obvious this was a big fish pool! And that it was! After carefully negotiating my way across the slow deep pool, trying not to fall in or spook the pool, we got to the fishable side of the pool where the run was on the opposite side and the eddy was in easy reach. It was running about 6ft deep, too deep to wade but just the right depth for me to french nymph. After working the crease closest to me, where the quicker water meets the slack on the inside it was obvious the fish wern’t there! Or was it my flies not getting deep enough? So it was into the box, and on with the 3.5mm tungsten. First cast, indicator stopped and upriver she went, with nothing but my 3 weight rod to stop her I knew I had a fight on my hands. Running, diving and doing everything possible it could to free my hook I gently persuaded her into my net. And after a quick photo, off she went to fight another day. 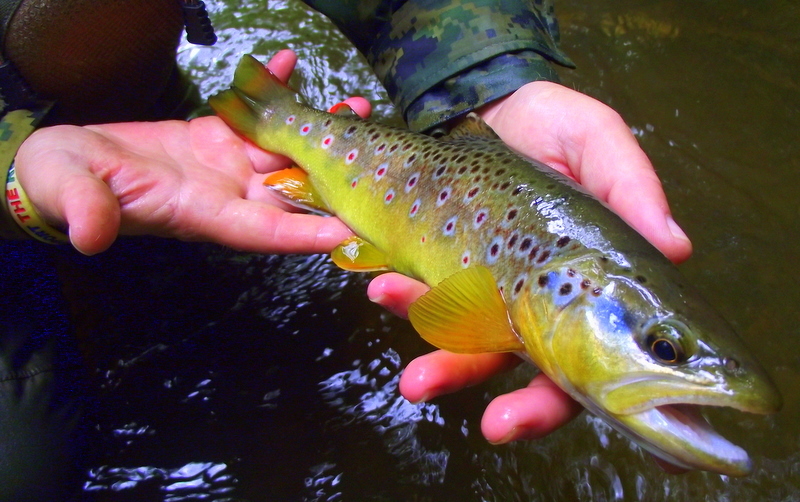 After taking maybe 20 fish between us, and working near enough a mile upstream Kieron, Pauls son joined us. Kieron tackled up with basically the same as me, two jigs on a french leader.. although they were from his secret box which doesn’t come out a lot 😉 I have tried to have a look but it seems to disappear quicker than the little minnows in the shallows. He was quickly into his first fish, taking one second cast around the pound mark on a red tag jig. Bushy spotted another just swirl under the surface and the next cast, it was in the net. The river above where we met, started to get wider, slower and deeper. By this time there were not so many flies hatching and the fishing started to slow down. So we started to move to the head of the pools taking the easier fish just to build our numbers up. Not long later we decided to make a move after a long day searching with better than expected results. 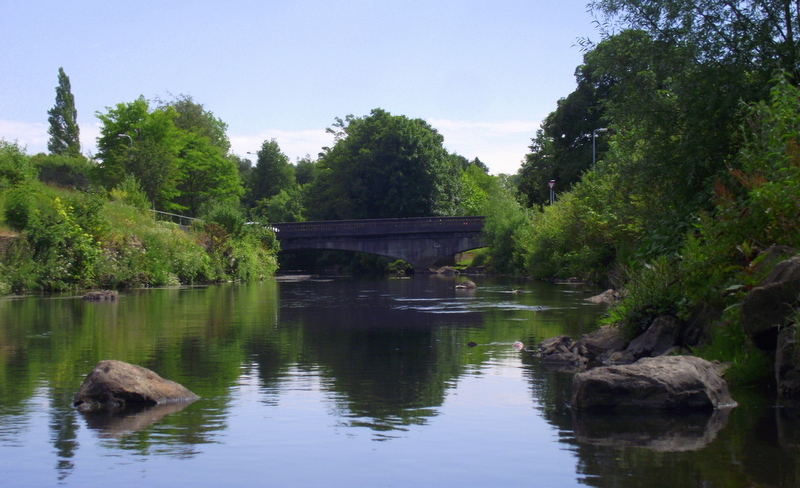 This entry was posted in River Taff and tagged brook duns, dog, fishing, fly, fly fishing, trout, waders on June 4, 2011 by fishstalker666.